Arundel had a poorhouse from at least 1682, probably sited on the east side of Park Place (VCH, 1997). In 1713 it was recorded as housing poor children and widows. A new workhouse was built in its garden in 1779-80. Arundel was incorporated as a Gilbert Parish sometime after 1782. In 1831, it built a workhouse and the same site at the southern end of what had become Poorhouse Hill, now Mount Pleasant, in Arundel. Arundel former workhouse site, 1874. Arundel's status as a Gilbert Parish exempted it from many of the provisions of the 1834 Poor Law Amendment Act. The workhouse continued in operation, having 41 residents in 1841, 33 in 1851, and 15 in 1861. The Parish continued in operation until 1869 when all remaining Gilbert Unions and Parishes were abolished. Arundel then became part of the East Preston Poor Law Union. 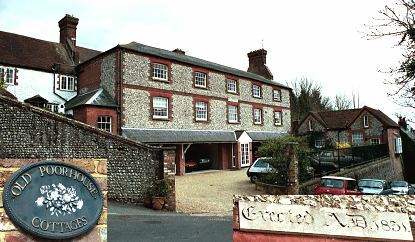 The Arundel workhouse initially remained in operation prior to a new union workhouse being erected at East Preston. In 1871, the Arundel premises saw a period of use as a temporary smallpox hospital. In the earlier part of the twentieth century, the building was used as a club house and in 1985-6 it was converted into flats. West Sussex Record Office, County Hall, Chichester, West Sussex PO19 1RN. No formal Incorporation records exist but some parochial poor law records are held. A History of the County of Sussex: Volume 5 Part 1 (OUP, 1997).